........well, not quite, but let me tell you with this heat we're having I almost wish for some snow! But. not today, today we feature FRESH by Authentique! Everyone pretty much knows that Authentique is one of my FAVORITE paper companies and they NEVER disappoint! Fresh is no different, it stirs up memories of long sunny days at the beach, of soft ocean waves, the sand beneath your toes, the excitement of finding a seashell, and the bathing beauties of bygone days. It marries a soft, relaxing aqua-y blue with bold reddish-orange and pretty grey to bring it all together. I have to be honest, it was a difficult line to work with. As beautiful as it is I lean more towards vibrant colors, pinks, yellows, purples, reds, etc., and Fresh is much more low key........ but I LOVE a challenge! I didn't feel it lended itself well to cardmaking and I didn't really have any pictures I thought I could do with it, I was in a pickle. The collection almost demands softly blurred photographs in sepia tones, anything else would just look misplaced and haphazard.......I had NOTHING! But, as I was perusing Facebook one day a friend of mine posted a GORGEOUS picture of himself with his beautiful girlfriend at his family's lake house. 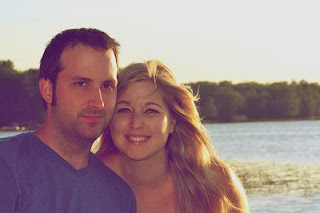 This was THE perfect picture, taken at sunset with a softly blurred background, the lake in the background, and featuring two lovely smiling faces and the perfect colors. I wish I could take credit for taking this amazing picture, but alas, I cannot, I am not a good photographer, I would like to be, I appreciate good photography, there is just a disconnect between what I see in my head and how it turns out! lol. I can take credit for the layout and I guess for knowing the subjects of the photo ;) I emailed him immediately to get permission to use his photo, I mean, the balls had already started rollin' and I had the layout done in my head before he even said, "YES"! Isn't this photo awesome?? I hope my layout does it justice. I used two main papers from the collection. The background paper is entitled "Light" and the mat & accent paper is entitled "Free". I also used just a couple small pieces of the orange paper from the 6x6 pad. which I die cut using my Scrap Happy exclusive die, Flag Banner Trio. I cut the waves with my LaLa Land Crafts Border Waves die, added several aqua and orange bling......other than that, everything else is from the collection's sticker sheet and alpha sheet. That is something that is different for me, I don't use a lot of stickers in my layouts and cards, etc., but Authentique's sentiments and images are so unique and lovely and the quality of their sticker is second-to-none that I find myself using them more than any other, they just compliment beautifully. That being said, I do find myself using Authentique's sticker sentiments and alphas in my other projects, as well. Well, that's it for now, stay tuned for even more Design Team works of art and some sneak peeks from CHA and what's to come! I have gone through your blog. The photos are really excellent. Likers will definitely like it. I am really thankful to you. Please visit my site http://www.thememoriesplace.com/ You will get all your information about fleece blanket trough the site.